Home BlogBig Island Big Island Volcano Tours – Cancel Or Go With The Flow? You may have heard the news networks reporting nonstop about the recent volcano eruptions, fissures and gigantic ash plumes smearing the Big Island sky and forcing locals to evacuate their homes. Even local news networks here in Hawaii continue to send their reporters in to capture the tears, donations, traffic and raw feelings that Pele, Hawaiian goddess of fire and volcanoes, evokes from their unending loss. As a visitor to the Big Island, you might be in a panicked state, trying to change your flights with a crazed frenzy. Big Island volcano tours need to be cancelled, new reservations booked, fees paid, flights changed – but do you really need to adjust your whole itinerary? Does the Big Island need to be completely stricken off your to-do list? There’s a lot of confusing media about the Big Island eruptions out there, so let me break it down for you. 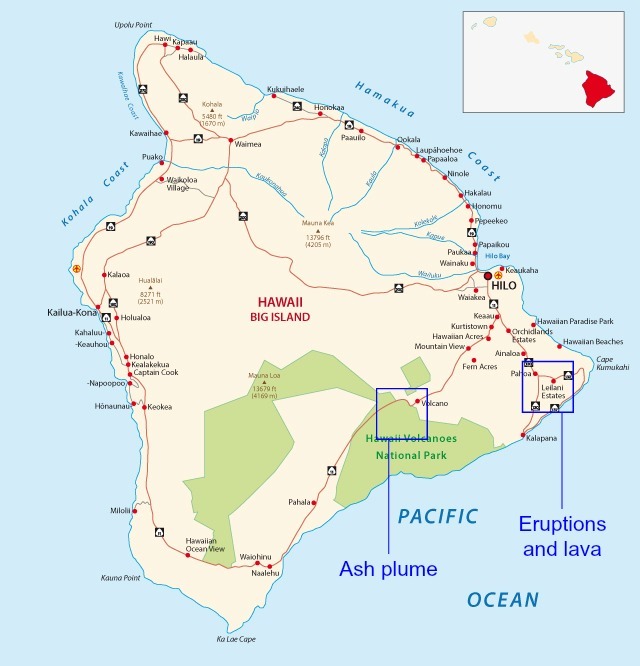 Hope this helps you with your Hawaii vacation planning and gives you a new perspective on booking those Big Island volcano tours. 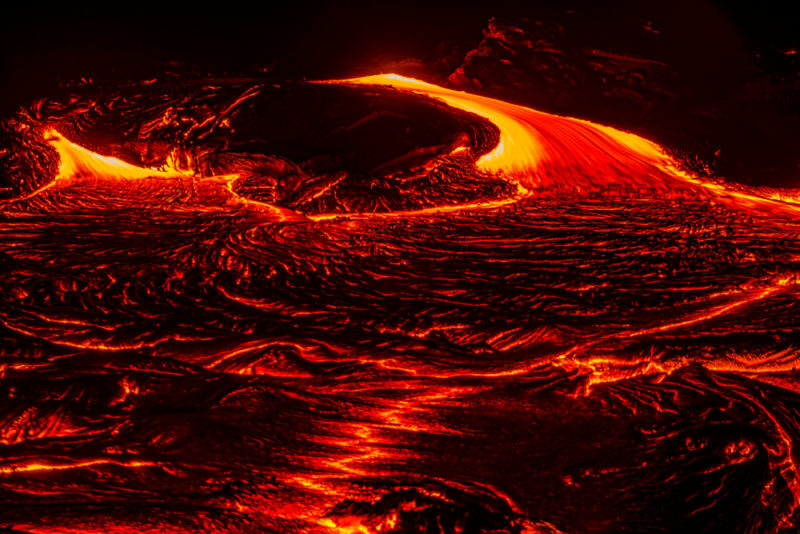 If you really want to see lava, don’t miss this chance. In fact, now is the best time to go on Big Island volcano tours because the fountaining has been incredible. This is an extremely rare sight that is a once-in-a-lifetime event. The dangers are minimal as long as you listen to authorities and the affected areas are tiny compared to the rest of the Big Island. What's Really Happening On The Big Island? 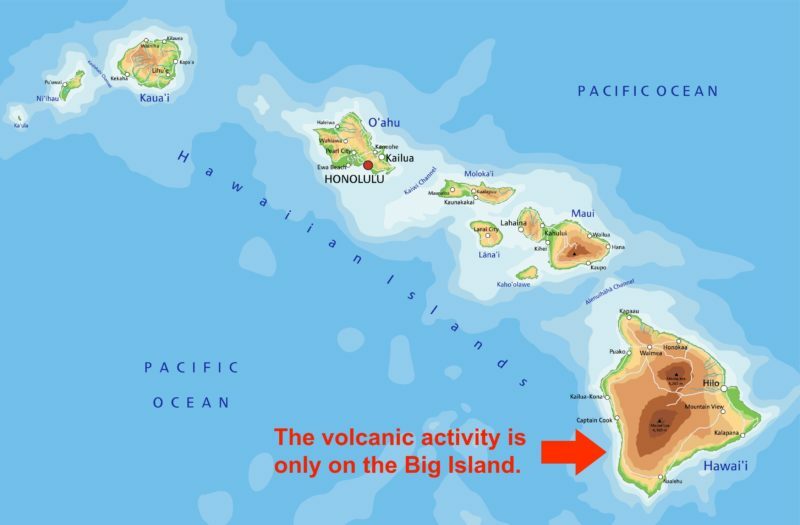 The biggest confusion (in my opinion) is that the Big Island is also called Hawaii Island. Many of the news articles out there are saying “Hawaii eruptions” or “Hawaii volcanoes”, which is misleading since the other Hawaiian islands are perfectly fine. So no need to cancel your Hawaii flights if you’re headed to any of the other islands. Most Big Island residents are reporting clear skies and clean air so unless you’ve heard otherwise from your Big Island volcano tour company, there’s little reason to change plans. The other misleading fact is where the eruptions and ash plumes are. The eruptions are happening in the Puna district, namely the Leilani Estates where most of the evacuations are happening. This is a small area where roughly 2,000 people on Leilani Estates and 10,000 evacuees have been affected by the lava. In comparison, as of 2011, there are 186,000 people living on the Big Island. The ash plume (think a big cloud of smoke that is super cool to witness, really bad to inhale) is coming out of the Halemaumau crater, Kilauea caldera, in the Hawaii Volcanoes National Park. The winds are currently blowing the ash southwest as far as Pahala, which means you’ll be avoiding Leilani Estates, Kilauea Summit (Hawaii Volcanoes National Park) and Pahala. That’s still more than two-thirds of the island for you to explore! The volcano eruptions that are forcing locals to evacuate are in or around the Leilani Estates. This is a remote part of the Big Island that not many tourists visit. Hilo, north of Leilani Estates and popular among visitors is 20 miles away and is unaffected by eruptions and ash. Halemaumau crater has been experiencing explosions paired with occasional earthquakes and huge ash plumes that are hazardous to your health. The crater is inside the Hawaii Volcanoes National Park, which is currently closed (certain areas). The media has reported that it is possible large boulders can fly up into the air from Halemaumau, which certainly sounds scary – but again, this part of the park is closed so nobody should be in this area if this does happen. The second worry from the ash plume is when and where it settles. Currently, the winds are pushing the ash to Pahala in the Kau district, which is having an effect on the community there. As I write this, Hawaii Volcanoes National Park states on their site that two-thirds of the park is closed. You can still access the Kahuku Unit. Check their site for updated alerts. How Does This Affect Your Big Island Trip And Big Island Volcano Tours? Let’s assume that you’ll just avoid the affected areas with a healthy radius for potential ashfall. So what else changes and what doesn’t change? Will you have to cancel your Big Island volcano tours? You won’t be able to see the Thurston lava tube, which is very close to the Halemaumau crater. But this isn’t too much of a biggie in my opinion. It’s crowded and you don’t learn very much. Read about my favorite lava tubes here. As of now, you won’t be able to access two-thirds of the Hawaii Volcanoes National Park. But the Kahuku unit is still open where you can explore and hike. Read about Meghan’s hiking experience there. Many Big Island volcano tours are still open for business. In fact, it’s been very active recently so your chances of seeing the lava flow are even higher now. View the giant ash plume. The park may be closed, but you can still see this huge cloud of smoke from certain vantage points. Check the video below for a sneak peak! Flights into and out of the Big Island have not changed – none of the eruptions or ash plumes have affected the airports. Can You Still Book Big Island Volcano Tours? One of the biggest reasons why the Big Island draws such a crowd is for the chance to see lava in action. 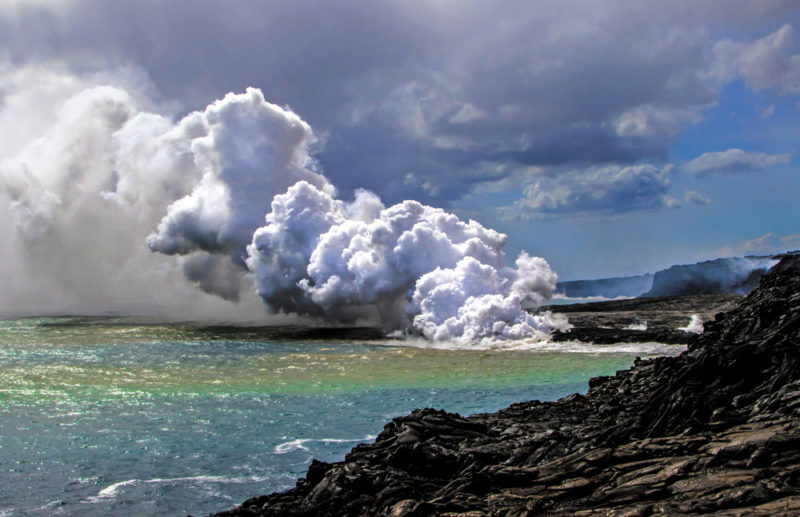 Whether it’s glowing red lava at the lava fields or spewing into the ocean in a cloud of smoke and steam, it’s an awe-inspiring act of nature to witness. Predictably, a few Big Island volcano tours have closed down temporarily; however, most seem to still be in business and have lined up safe viewing spots to see the lava and experience the rest of the Big Island. Lava tours run by Paradise Helicopters have luckily been mostly unaffected by the recent eruptions. In fact, they’ve seen a slight increase in bookings along with an increase in volcanic activity. Rather than the eruptions, weather is the culprit that causes most cancellations and their pilots safely navigate the ash plumes by keeping a wide berth. Sunshine Helicopters also reports that their customers have been ecstatic recently with the views of the lava flows on land and in the ocean. There is a flight restriction above the Puna residences, but you can still see the power of the lava from a distance. 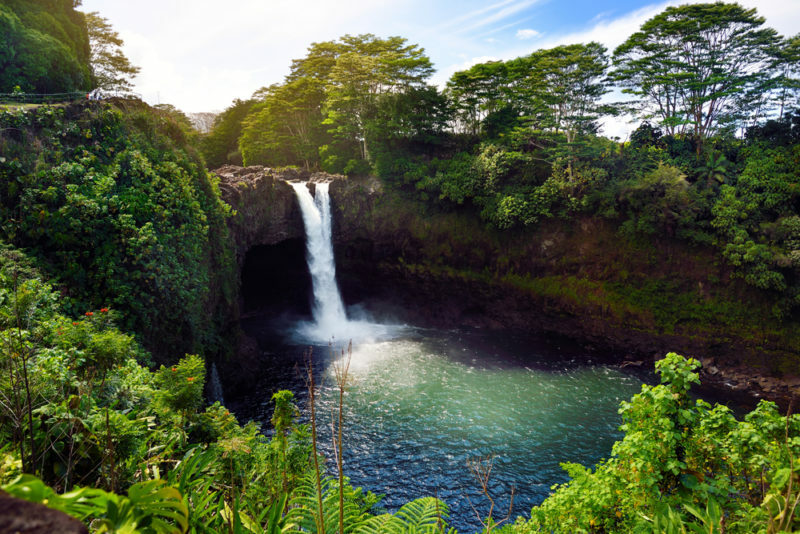 Interested in shopping for a variety of Big Island tours and attractions? Click here. Update: In Mid-July 2018, a lava bomb show out and severely injured a passenger while on an excursion with Lava Ocean Tours. You can read the story on Hawaii News Now. On the other hand, the land and sea tours have felt the impact of volcanic activity more heavily. Hiking tours have 3 choices when it comes to lava: Ocean entry, Hawaii Volcanoes National Park, and private land. Find a Big Island volcano tour that views lava on private land if you’re determined to see lava. Aloha Lava Tours has access to private land where they’ve been able to see lava. Licensed boat tours for ocean entry lava viewing have also taken a hit. There are only 4 licensed boat tours on the island and 2 of them have already postponed tours indefinitely. 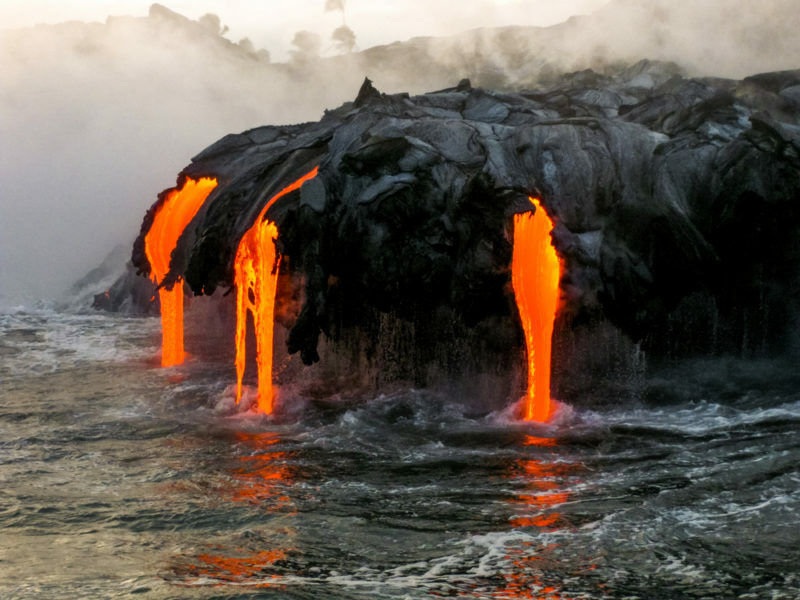 Hawaiian Lava Boat Tours has stated that they will resume tours at the end of May to the new ocean-entry lava at Pohoiki and depart from Hilo Harbor. Unfortunately, Kalapana Cultural Tours is one such company that has had to stop their reservations as they have been affected by the lava eruptions both in business and their personal lives. If you would like to stay informed or offer your help, you can visit the Puuhonua O Puna Facebook page that’s been set up directly for Puna residents. I don’t want to send you into the Big Island pretending everything is fine and dandy over there – it’s not. But the dangerous areas are localized and authorities have taken extra precautions to keep us safe. In fact, only about 0.02% of the Big Island is covered by the new lava. Now more than ever it is important to follow the rules and listen to the police and warning signs when you see them. Here are a few injuries, dangers and tips to help you get a clearer picture and navigate your way through the Big Island. Update: Jessica Tilton was severely injured when a lava bomb shot out and hit her leg while riding on a lava boat tour. The tour she was on was operated by Lava Ocean Tours. Read the full story here. Darryl Clinton landed in the hospital when a lava bomb hit his leg. He and other community members were protecting neighborhood houses from burning using fire extinguishers and water. Read the full story here. A resident in Leilani Estates was trapped at their residence with lava coming down their street. Luckily scientists who were operating a drone for study purposes overheard radio transmissions and were able to guide the resident out to safety with their drone. Read the full story here. The ash should be avoided as it will affect your breathing, health and may sting your eyes. You can learn more here. Choose strong, windy days for your Big Island volcano tours because the wind is predictable. The worst day to choose is when winds are light and variable. The last thing you want are noxious gases coming your way when the wind suddenly changes direction. This is even more important on boat tours where winds can be fickle and poisonous gases come out in full force when lava hits the ocean. Hawaiian Airlines are offering travel waivers based on when your ticket was purchased and flight dates. Stay out of the Puna district unless you’re there to help. No flying drones over the lava flows. These are no-fly zones reserved for emergencies. Cancellations from May through July have reached $5 million. If you ever wanted a smaller crowd, this is the time to do it. So Should You Cancel Or Go With The Flow? I’ve listed all the facts as simple as possible, thought about the possible dangers, and have reached out to Big Island residents asking for their input. My attempt here has been to provide you with information and situations that will have a direct affect on your trip to the Big Island. As we locals watch global news networks, we see the eruptions being portrayed as this horrible event affecting all of the Hawaiian Islands, when in actuality it is a horrible event affecting a very small part of one island. However, as we watch our government, tourism board and local companies being interviewed on the news, we instead hear a lot of disbelief and exclamations about cancelled trips and how this will affect our tourism. I’m definitely planning a trip to the Big Island and soon. I want to see the big fountains of lava that probably won’t ever be this big again in my lifetime. I want to see the giant ash plume that shoots 15,000 feet into the air. I will not break the law and run into the Hawaii Volcanoes National Park and get tasered by security. I will check the weather on a daily basis and choose windy days to see the lava. I will enjoy the rest of the Big Island’s hikes, waterfalls, shopping, tours, snow, turtles, black sand beaches and villages. If I don’t go, I will regret it. How timely and informative! I’ve been wondering this myself because I was planning to take my grandmother in a few months. Sounds like it’s generally safe! So glad this could help you out! I actually wasn’t intending to write this article, but I’ve been seeing so many conflicting views that I thought this would clear things up. Have fun on the Big Island with your grandmother – it’s a gorgeous island! My husband and I are from Florida and had made plans since last summer to go. We were concerned at first when we heard of the events in May but with plans already that had been made decided for the adventure. We stayed in the town Volcano which is just outside Volcanoes National Park. The Park was closed but did hikes outside the area and felt a couple of tremors during the three nights stay at that town. We stayed at Kona during our vacation and loved it on the beach and also stayed a couple of nights in Hilo and went on the Lava Boat tour and a doors open helicopter over the lava. Thank God we stayed with our plans! What an awesome vacation. The helicopter was unbelievable and the Lava boat tour was actually the one that has recently had a problem with the lava bomb. We never felt in danger the the experience was once in a life time. Don’t stop from going. We have been one the island one time before so we knew the area a little but this time was remarkable. Again the Hawaiian residents are so very nice and it was wonderful! It’s wonderful to hear that your time on the Big Island was fantastic! I’m glad you decided to stay with your original plans and not cancel everything. It must have been wonderful to see all of that lava! I’m glad that I was able to break it down and explain it to you so simply. I’ve been following the news from overseas! I’m so glad those who needed to evacuate were able to safely and wish them a swift return. And I hope the tourism industry isn’t too disrupted! Yes, we’ve all got our fingers crossed for both the residents and the industry! Hopefully you can make it soon to catch these bigger flows! As crazy as it sounds, I want to visit the Big Island more now that there’s been this eruption! The last time I was there was about 10 years ago, and we did have a chance to walk around the park and see the “active” volcano, which was cool for sure, but I can only imagine how much more incredible it would look now. Hopefully everyone stays safe and those who have trips booked already have a once in a lifetime experience seeing the views there! For anyone planning on going to the Big Island this summer, this is an extremely helpful post! It’s great that you took the time to help cut through the media chatter and lay the facts out. Mahalo! Yes, it took some time putting it together, lol. But hopefully it will be useful for anyone out there contemplating a Big Island trip. I totally agree that media always plays the hoax ans scaring people away by saying things in mammoth proportion while it is actually nothing! Your post is so informative and for me it is a definite yes to visit! This is so well researched, thank you for sharing! It’s so important to be mindful of the locals who’ve had to leave their homes too while visiting the area during this crisis. You’re very welcome! Yes, quite a few homes have been destroyed but the Puna area has been really strong and responsive in giving aid to whoever needs it. Interesting post. I recently learned a bit about volcanos in Peru. Fortunately, the ones there are currently sleeping, just a little smoke once in a while. However, volcanos are impressive and show how powerful nature is. Not sure if I would like to see a lava spitting volcano in reality. Videos may be enough for me :-). True, the videos are pretty awesome by themselves! I keep seeing them on my IG feed! You’re welcome, Susan! For sure, when will we ever get to see volcanoes like this?